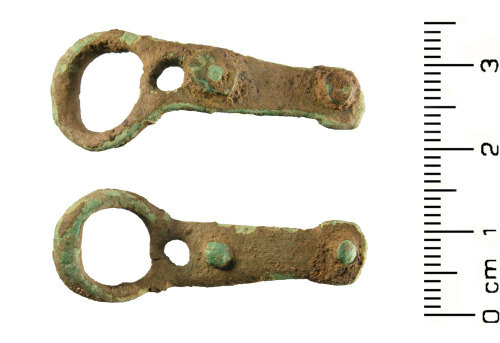 An incomplete copper-alloy buckle of Medieval date, c. AD 1250 - 1400. The buckle has a single looped oval frame with a narrowed bar formed from a circular perforation in the integral plate. The plate is sub-rectangular and tapers from the buckle loop to a rounded end; it has two further circular perforations which have rivets in place. The pin has been lost. The front and back of the buckle has no visible decoration. It is mid-brown in colour with a light green patina where the surface has been abraded. Similar examples are illustrated in Whitehead (1996), p. 33 and are dated to c.AD 1250 - 1400. The metal has a mid-green patina and is worn. The buckle is 35.08mm long, 13.34mm wide, 4.72mm thick and weighs 2.77grams.